At WorkChoice Solutions our mission is simple – to help organizations large and small maximize leadership and team potential. We achieve this outcome by helping individuals and teams successfully navigate the changing landscape of the world of work with the chief goal of peak performance and sustained financial success. It is our belief that all individuals, regardless of role, respond to the challenges of today’s workplace in ways that either support or inhibit the realization of key business objectives. 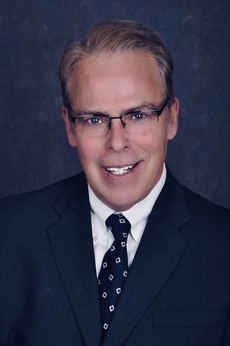 Often the gap between senior management’s view of these challenges and that of the rest of the organization creates a significant obstacle to achieving maximum performance potential. At WorkChoice Solutions, we go the distance to turn your people performance challenges into real opportunities. your unique needs and respond with culture specific solutions that are aligned with your business strategy. WorkChoice Solutions helps organizations bridge the gap between where they are and where they need to be in terms of employee performance. We help key executives link their business strategy to a variety of culture specific programs designed to maximize the potential of individuals and teams. We also help develop meaningful metrics for evaluating the success of our work. The dedicated professionals who make up our team have held a variety of human resource, training and general management roles with emphasis on organizational and employee development. All of our programs and services are affordable, user-friendly and tailored to the specific needs of your organization. Our commitment to ongoing support helps ensure sustained value and impact from your investment. At WorkChoice Solutions, we love what we do and it shows. 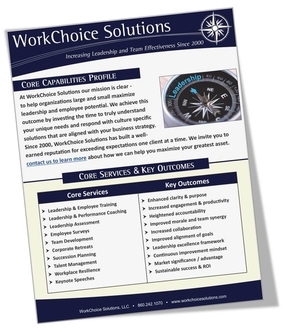 Click here to download our Core Capabilities Flyer.